All cable bundles were pulled apart and cleaned and then re-sewed, as there was brown dirt (mixed with urine) on anything and everything facing upward!!! All tubes took a bath in my sink and then tested... All are original Conn and were found within limits. The Tibia keyer cards were dunked into a pail of soap and water, rinsed in the sink (I have photos of all this action!). New hardware was used where corrosion from rodent urine made screws unsightly, not to mention a missing slot for the screwdriver! The key contacts were cleaned with silicone drenched cotton swabs, this brought back to life all the pulse wave voices (reeds, diapasons, and strings) which use the vinyl contact rods... Next was the dropping of all the oscillators for inspection and cleaning.. All the speaker frames were washed and the `snare drum' amplifier along with the main amp were also carefully wiped down. The console floor was caked with you know what, so it too was washed. The other brave thing I did, and don't suggest this to anyone, is the method of cleaning the pedalboard oscillator.. The thing was so junked up with debris and Decon that I did NOT want to even start to take it apart, there were just too many parts, and contactors all over the place! I could only get two notes to couple down from the accomp. manual, and there were dead notes here and there as well... I decided to take it outside, and after removing the tubes from it, I flushed it with the garden hose! FULL FORCE !! (and prayed it would work again someday!) After I felt it was hosed enough, I let it dry in the sun for the balance of the day, and then brought it in where it sat for a whole weekend... Later, I lubed each tuning pot and key contact with `Break Free' which is a great product, NOT a spray, you squeeze the lube through a small plastic straw, right where you need it. Next was to install this unit, put the tubes in and attach the plugs. Well, I was very happy to find that, it not only worked, but, I had all notes couple down from the accomp. manual, and NO dead notes ! Later, a full tuning was done and all has held nicely. The `chorus' piston is ALWAYS engauged, it keeps the sound from being too `in tune' and makes a less sterile, lush effect. All eaten through cables were spliced, soldered and `shrink tubed', no tape was used for these type of repairs. There is an amp rack behind the console which contains the only amplifiers used. Also the digital reverbs, 1/3rd octave stereo EQ and a line conditioner. Line level tap off of the swell pedal volume feed, (there are no RCA jacks anywhere in the instrument and this was the only line level feed without going into the preamp and unsoldering shielded cables off of bus strips!) this goes directly to the EQ. Here, the sound is `voiced' so to speak to regulate octaves which need to be brought up or down in volume. From here into the reverb where a stereo wash is blended with the mono signal, the right and left outs go to a stereo integrated amplifier. From this amp, one channel drives the internal Leslie in the Conn console, the other channel drives a modified Leslie 330. I removed the 15" bass driver and replaced it with a rebuilt 10" Gauss commercial driver opperated `full range' to match closly the console Leslie which uses an 8" driver. This puts the Tibias in a stereo right (console Leslie) and left (external Leslie) configuration. Note that I do not use the treble horn in the external Leslie, a tip I picked up from the ATOS magazine's `E Tones' section... If you want a truer Tibia trem, don't use the horn, otherwise, you get a jazz sound more true to the Hammond/Lesie setup... The AC motor control signal for the external Leslie is taken from the `Jones' plug on the rear of console. Both run together in the normal fashsion with the TREM tabs. Back to the amplifier outputs to the `pipe's. The matched set can be seen in the photo as being the `inner' right and left. Installed behind these are one piezo (Motorola) tweeters to bring out some `bite' and clearity to the strings and reeds. The large set is to the left `outer' and forward of the left small set. To the right is the medium set, which is forward of the right small set... The two reverbs are set to the same settings, this keeps the `four' channels all in the same `room'. 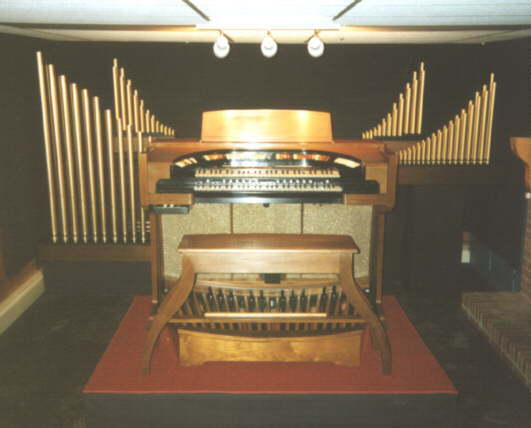 For the playing of theatre style music, the reverbs are set such that a short decay is heard, very much like that in the Paramount theatre here in Springfield MA when it is EMPTY... A long reverb is not suggested with the Lesilie in full tremolo, as a strange `echo' effect is heard and not the desired effect. To put the organ deeper `into' the reverb atmosphere, simply run the effect control toward the `wet' setting, there will be no mudiness heard here, since the reverb time is SHORT. Nowthat you have all this sound, where is the bass??? Found deep in the rear left corner behind the left set of pipe speakers and just to the left of the external Leslie, is the DBX powered subwoofer. The matching amp (all made in USA) needs to get a speaker output feed to drive it, since the internal Conn console speakers are NOT in use, and the main amp is just coasting, it became clear that this would be it's perfect use! I made use of the 6 pin Amphenol speaker plug on the back of the console. Both channels are fed through this jack and into a special cable, then into the subwoofer amp. Pedal 16' Bourdon and Diapason are VERY robust, a touch of low end is added to the 16' Tuba as well. Since the bass is NOT encluded in the reverb chain, there is no blurring of the low pedal tones. Addition of a digital pitch transposer for the pedal division, this will drop all 8' stops to 16', and all 16' to 32's !! This will be blended with the original pedal signal, so it will in effect double the number of pedal stops! Addition of a solid state motor controller for the Leslie speakers, this will allow the speed of the fast tremolo mode to be adjusted to taste. Four toe studs added to the pedal board `toe' plate. Subwoofer X-Over setting: 120 Hz.